If you’ve been hanging out with me for awhile, then you know I’m all about personal development! I’m always reading, listening, and watching things to fill my cup and make me better in business and in life! And around this time of year, I like to do a bit of spring cleaning in my brain — AKA I get really into clearing out the cobwebs and filling my soul with things that inspire me, push me, and make me feel great :). So today, I wanted to share some of my top reads, listens, and watches that I’m digging right now. And I’d love to hear what’s on YOUR list! So what about you? How are you investing in yourself right now? Let me know! Yesterday, I let you know that we’re running a special contest for listeners of the Business with Impact podcast as a way to say THANK YOU for being so supportive! Every week, we’re going to be giving away a $100 Amazon gift card to one lucky podcast listener! Step 4: For an extra entry, post a screenshot of the episode you're listening to on Instagram and tag @rachelrmcmichael! You can enter once per day, and we’ll be drawing a winner every Monday through the month of March! Thank you so much for your tuning in, engaging, and being such an awesome listener! I love sharing Business with Impact with you, and I can’t wait to keep bringing you new business insights so YOU can build your business with impact! I’m known as the go-to-gal for helping coaches and course creators like to you leverage FB ads to build the business of their dreams + create massive impact. But guess what? When I started out, I was just like you! I didn’t know everything about FB ads (I still don’t! ), and I had to learn a lot of lessons the hard way. 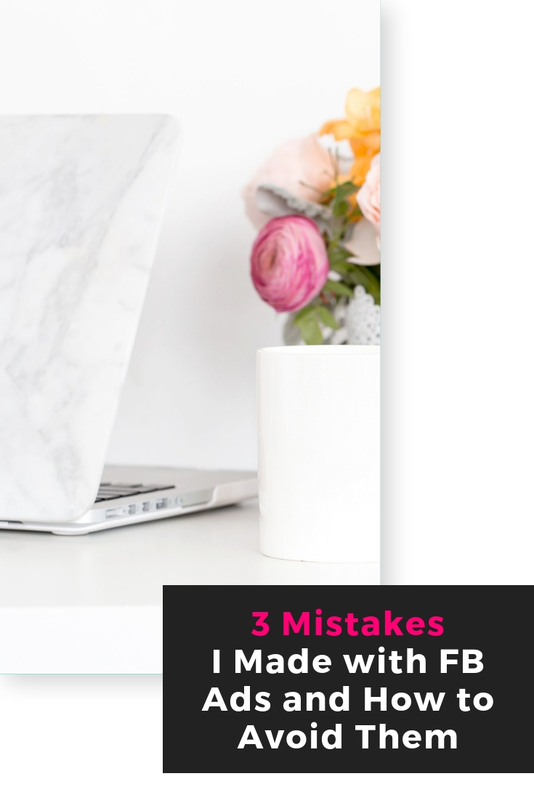 So, I thought I’d share those lessons so YOU can avoid the mistakes I made! Like a lot of coaches and course creators, I was really focused on budget when I started with FB Ads. I wanted to be sure I was optimizing my spend and getting a great return on investment. I couldn’t afford to lose money! But you know what I didn’t think about? The cost of NOT running ads! Like many of my clients, I avoided FB ads for a long time. I thought I could grow my list organically and be just fine. But all of a sudden I realized I was chasing down leads, pumping out content like crazy, and seeing little-to-no growth at all. FB Ads took my growth and accelerated it tenfold. I realized then and there that the cost of not running ads — all the time and effort spent trying to grow my list organically — far outweighed the cost of the ads themselves! Inside The acADemy, we’re BIG on testing funnels. Why? Because throwing big bucks into an untested funnel puts you on the fast track to wasting money! Before you start upping your budget, you want to make sure your funnel converts. Start small and then scale! There’s no such thing as a “failed” ad. Ads that aren’t working are simply giving us data so we can figure out what does work. A profitable ad campaign takes testing and tweaking — it’s an experiment! Pick a goal, stick to it, and use the data to see what’s working and what’s not for your audience. Then tweak and test again. Then do it again. And again (you see where I’m going with this, right?). There you have it, lovely! Ready to create your own campaign? I’ve got a free training with your name on it! I am about to get REAL with you. You know I’m all about staying positive, spreading light and love, and creating an impact in this world. But can we all agree that sometimes, life just gets hard! There are times when no matter how hard you try to stay positive, you’re still left feeling like you’re standing at the foot of a huge mountain wondering how the heck you’re going to climb it. Adversity is real, y’all — in business and in life. When baby brother was born (I can’t believe he’s almost two months old now!! ), we were thrown a huge curveball. He was admitted to the NICU for low blood sugar… and then we found out that a more serious problem existed. Essentially, baby brother would stop breathing several times a day. He’s home now and fine (Amen! ), but let me tell you friend… it was a crazy journey. We spent the holidays in the hospital, and we were so grateful to have the support of friends and family who were praying alongside us. I am a FIRM believer that you can face anything with the right mindset. The mindset trick I use? I rest in gratitude. No matter WHAT the circumstances are, gratitude grounds me. It places my focus on being thankful and present instead of being frustrated and thinking about what’s “going wrong”. So how can YOU use gratitude to overcome adversity? Practice makes perfect! Start by writing down at least three things you’re grateful for every single day. Get into the habit of focusing on what’s going right vs. what’s going wrong. And when you face adversity, go back to your list! Where is the silver lining? How can you grow from this? When you put your focus there, everything changes :). I’d love to hear how YOU create a positive mindset, especially in times of adversity. Comment down below! I read every single response. What Valentine's Day is all about! I’m really feeling those Valentine’s Day vibes this week! It just gives me so many warm fuzzies. Speaking of telling people you appreciate them… I’m taking a quick break from picking out Valentine’s for my daughter’s class + snuggling up with baby boy to tell YOU how much I appreciate you! You are such a joy! I am so honored that you trust me to help you grow your business. Being a part of your journey is a dream, and I am so incredibly grateful for you! Thank you for including me in your life and showing up each day as your lovely, wonderful self. You are amazing!